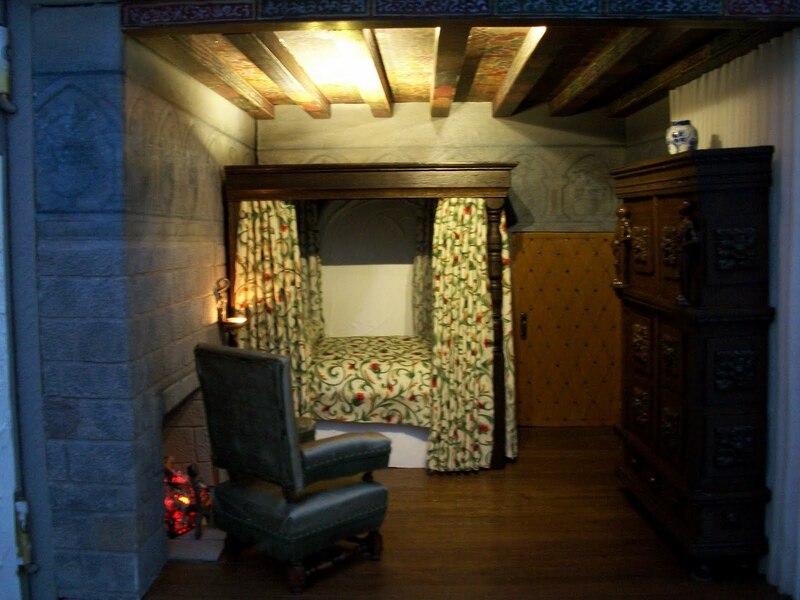 This particular room in the real property is actually an extension to the original building, thought to have been created between 1617 and 1620. The back wall (with the painted archway and studded door) is actually the original outside wall. There would have been a wooden gallery here with stairs winding down to the street. The extension in fact goes up three floors. 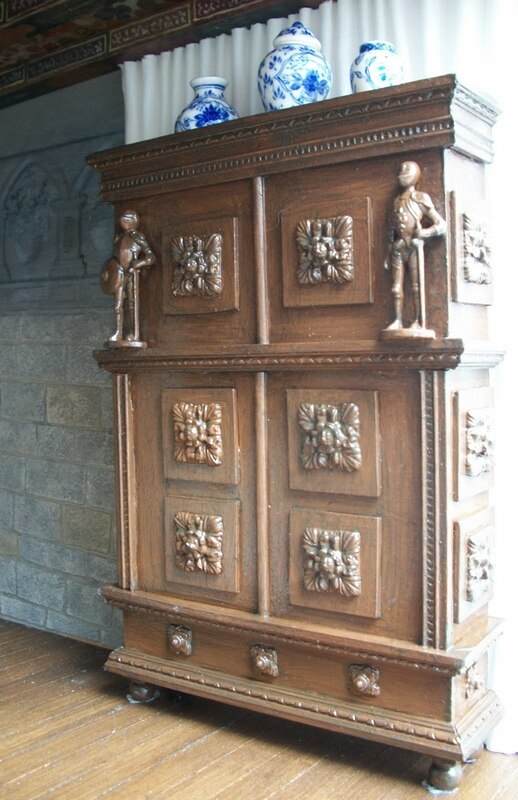 This is the Dutch cabinet which I've shown in a previous post with the three blue and white jars. I made the cabinet as I couldn't find anything shallow enough given the amount of space I had to work with. 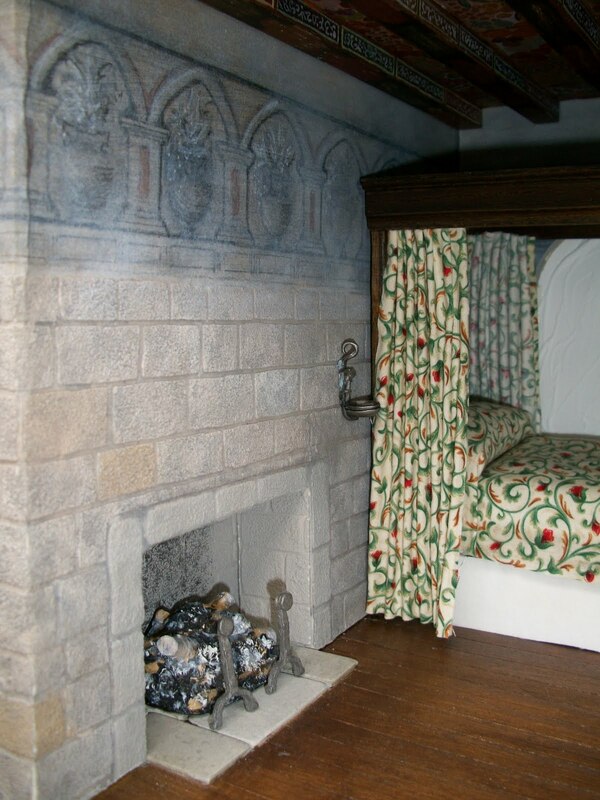 The wall behind is hung with linen but tapestries would have been used in a grander property. 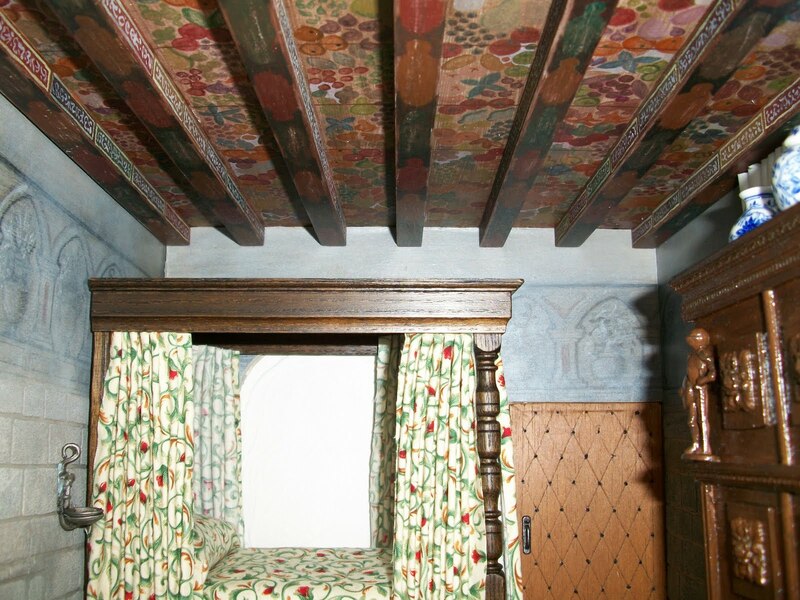 The stencilling on the walls goes all the way round the property and was discovered during the restoration of the building. I managed to recreate the effect with pencil and paint. The walls were produced using a stencil and compound, shaded then sprayed with varnish to fix. 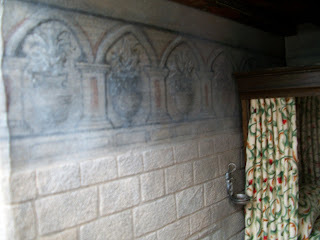 A close picture here showing more of the detail on the stencilled wall. The painted ceiling was added at the time of the extension and is an excellent example of it's type. 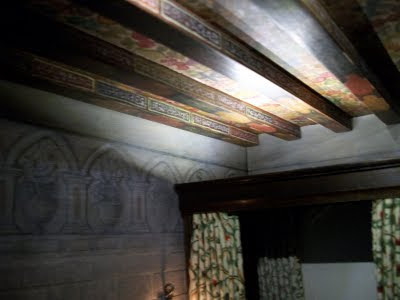 (I've given some detail of the ceiling in an earlier post). This particular ceing was painted by my sister Valerie - so thank you for that V, x. You can poke the picture for a closer look at the detail. 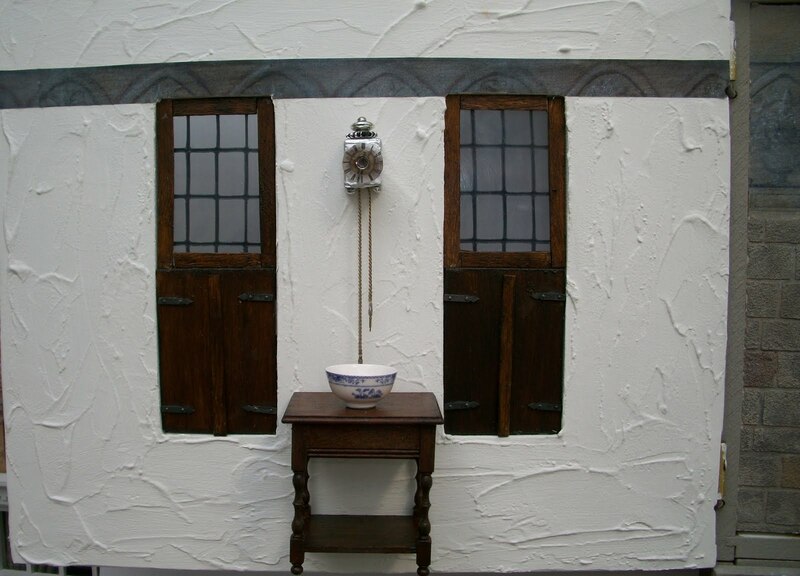 The lantern clock on the "fourth wall" sits between the two shuttered windows. I made this clock from little bits and pieces I had by copying photographs of the original timepiece. 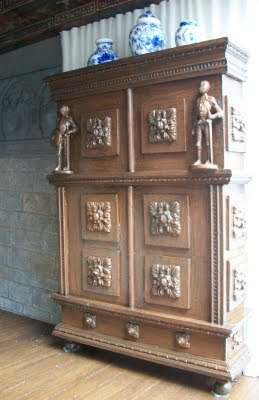 My contact in the original building was very helpful in sending me pictures and measurements. The little table is a Mini Mundus kit and the bowl was purchased from Stokesay Ware. The Painted Chamber taken at dusk showing the lighting I've used to highlight the ceiling. It's a pity about the glare but I wasn't able to do much about that. I used LED lights for the first time here and I think it's worked out pretty well. The tricky bit was finding somewhere to conceal them! This picture also shows my first attempt at a chair. You can see here: The Painted Chamber what I've been aiming for although I did have a much smaller space to work with and I've tried to just pick out the main features of the room to create the right feeling. One word sums up this room Irene - stunning!! Wow, Irene! It looks Fantastic! I LOVE every bit of it..... wish I could climb right into that bed.... LOL! You have made an amazingly faithful copy of the original.... I am always impressed when people insist on the minute perfections! It is just STUNNING! Irene, This room is so remarkable!!!! I love all of the details that you have in there!!! Just amazing!!!! This room is amazing. Congratulations Irene! You did a splendid job. Fantastic. Love all the details. What a great job you did! If I close my eyes, I can be thrown in the seventeenth century... I need a stool to get on that huge bed! Your sister also has my admiration for his skillful work. I'm a friend of Valerie's and she directed me to your blog. Your miniature work is amazing. 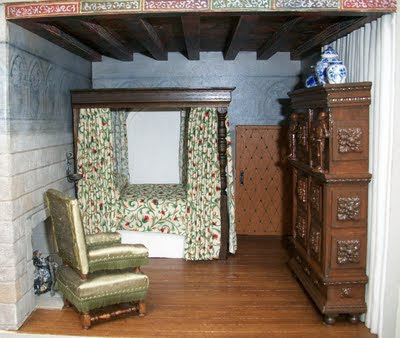 It is difficult to realize that this is not a full scale room. Great details. I would imagine it is also difficult to get the lighting just right to take photos, but you do that so well! Valerie did a wonderful job on the ceiling too! Beautiful! !